I’ve done me a fair number of Jaywalker socks in my time. It’s one of the few patterns I’ve done multiple times. (I could tell you about that winter I knitted five Harry Potter scarves as gifts. Oie.) It works for me because when I take it with me on transit or travel, the monotony of the 2-row repeat is just soothing enough to chill me out but easy enough that my brain can still think thoughts if it wants to. Lorna’s Laces Shepherd Sock has become my yarn of choice for the Jaywalkers since it’s lightweight enough to work on the 84-sts size I need (keep in mind that this pattern biases quite a bit), the yardage goes for days (did I mention I have Size 11 feet?) and the colourway options are just about endless. This is LL Jaywalker pair #5 for me, which puts me 2 pairs away from one for every day of the week. And totally orange/green on the bottom. Wild. I can’t get mad at it. I mean, not only did the yarn pool so neatly but it had the courtesy to leave my favourite 2 shades of the 4 on the most visible portion of the sock. Thanks, Rockwell colourway. We can be buds. And now, I get to start new socks. That’s the best part of finishing socks, am I right? You are more forgiving than I when it comes to pooling. The socks are lovely and in a pair of shoes, who is the wiser? that colour pooling reminds my of hypercolour shirts… remember hypercolour?! 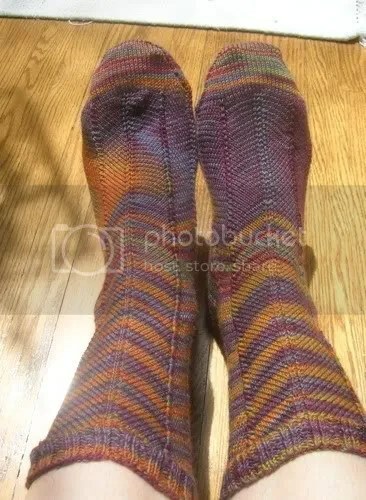 I know that we’re all supposed to hate pooling, but I can’t help but love how wild those socks look! I have a pair of BMFA Jaywalkers that did something really similar, they’re funny but I like that about them. Your socks really look great….makes me want to start a pair of Jaywalkers. You have size 11 feet? Wow. I thought my size 9’s were big. I love pooling, so I think these are great. Enjoy. That’s crazy. I’d rather have the orange on top though. Wonder if you could change that somehow? Anyway — at least it pooled to make the colors you like better break away from the ones you don’t like as much! I love how the yarn striped on the legs. The pooling wouldn’t bother me either, since it will be covered by shoes. Great colors! Totally cool socks. Love the colors! My feet are the perfect size for virtually every brand of variegated yarn to pool like nobody’s business, but I’ve never seen it go half-and-half like that before. Usually it spirals up the leg, for me. Yup my Lorna’s Laces did that a bit too! Weird how they only starting doing that on the foot. these are the most lovely socks! 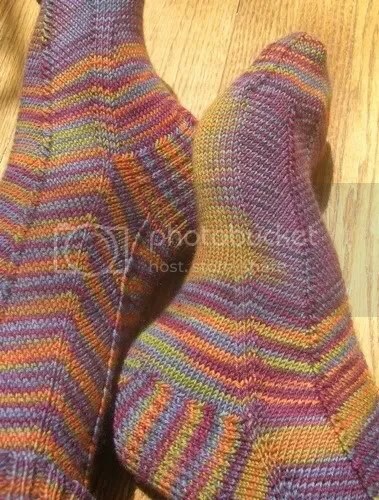 i have never seen socks i wanted to knit until now – the yarn & pattern are a perfect fit! great socks! I knit a pair for my mother, I should knit one for myself! Wow. That’s some pooling. But I dig the colorway! Lovely.